He was a Siamese cat in an animal shelter. He had everything he needed. Everything except a home. I need a good home. He had given up on anyone choosing to take HIM home, and frankly, he wasn't sure he even wanted to go home with any of the cruel, tail-pulling hands. But, there is THAT boy. Will he choose ME? One who doesn't pull my tail. Won-Ton is the story of a homeless cat who gets adopted by THAT boy. 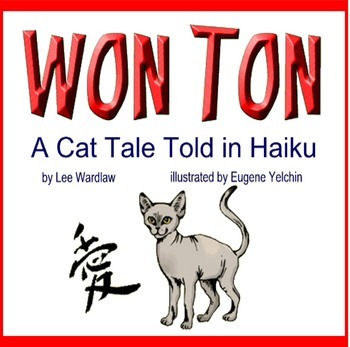 Won-Ton, himself, tells his story, in the voice of the fearful, playful, picky, silly cat he is. Written in the 5-7-5 syllable Haiku pattern, his clever, funny story will make you want to tell the story of YOUR pet in Haiku, too. 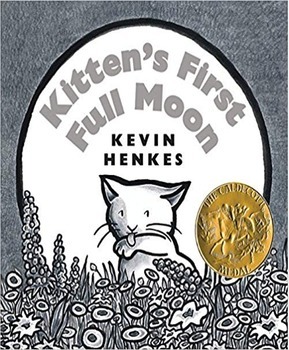 Kitten's First Full Moon is the story of a kitten venturing out into a dark night and discovering the bowl of milk waiting for him. But his attempts to reach it lead him on an funny adventure. The 12-page literature guide for KITTEN'S FIRST FULL MOON comes to you in PowerPoint and PDF formats for excellence in projection and speed in printing. Bad Kitty wasn't always BAD. He used to be a GOOD Kitty when he was fed the food he loved. But fortunately for us, Bad Kitty becomes the best alphabet book ever! First Kitty goes through the alphabet being fed those bad vegetables from A to Z ... you know, the ones we all dread so much! He becomes... Bad Kitty shredding everything from A to Z! Then, when his diet changes to better fare ...f rom hippo hamburgers to baked zebra zitti ... he becomes GOOD KITTY and begins doing good deeds from A to Z to make up for his bad behavior! The pictures and food will keep you rolling on the floor laughing as you learn about vegetables, alphabetical order, and BAAAAAAAD Kitty! How is Kitten's First Full Moon like Won-Ton and Bad Kitty? How is it different? Compare these award-winning books, and you'll have a great learning opportunity! Our Kids Wings units will help lots! SPLAT THE CAT is worried about the first day of school. Will he have any friends? Maybe he should take his pet mouse, Seymour. That way he will be sure to have a friend. All kinds of problems seem to try to keep him from going to school. The front door is stuck. The gate won't let go of his fingers. Things like lamp posts won't get out of his way. What will his teacher, Mrs. Wimpydimple say when she sees him? What kinds of lessons will she teach? Will she mind if he asks WHY a lot? Have you ever had those feelings? How did it turn out for you? Splat has one big surprise on that day! Can you guess what it is? Splat the Cat by Rob Scotton is the perfect first-day-of school read aloud ... to students of every age, going into every grade! Even the teacher will love it! We've all been there! It will give them a giggle and help them breathe a sigh of relief as Splat wakes up early the next morning raring to go. The illustrations are as hysterical as the story and both will delight your students! 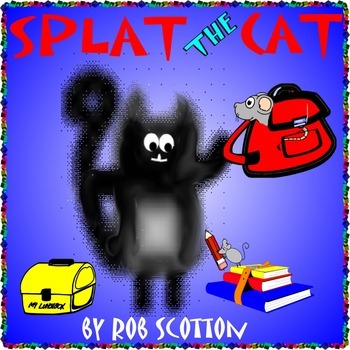 Included in the Kids Wings' activity guide are pre-reading discussion cards, a readers' theater script, and many enjoyable activities that complement and extend Splat the Cat by Rob Scotton.